The Lyons Din: How do you get to Carnegie Hall? She was only 5 years old when I found a local woman who taught children's singing lessons. After only a few short months, when the annual church fair came around, the teacher got time on the stage for her students to perform. 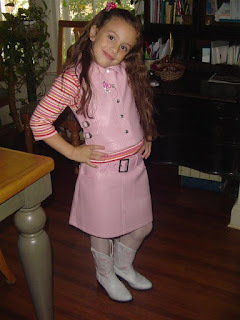 And so, one Saturday night, my adorable little curly haired miracle donned her pink pleather skirt and vest and her pink cowboy boots and took the stage to sing, "Behind the Hazel Eyes." She knocked it out of the park, too, without an ounce of fear or nerves. Did I mention she was FIVE? It was a momentous occasion for this proud mom, who stood in the back of the Saturday night crowd, crying her eyes out while holding up a primitive cell phone so my mom to listen while she was driving home from work. She cried so hard she pulled over to the side of the road. It was that memory which came back and stabbed me in the heart last night as that little girl, now a stunningly beautiful young woman of 17, joined some 30 of her fellow Destrehan High School Choir members on the stage at Carnegie Hall in New York City. The choir, which was proved to be a perennial powerhouse when it comes to annual state competitions, was invited to participate in the annual National Fall Sing in New York City, a commemorative event as part of the Remembrance of 9/11. Destrehan and five other choirs were invited to form a super Honor Choir, which would perform on stage at the storied hall. Pentagon survivor Sgt. Major Tony Rose and South Tower survivor Stanley Praimnath were the guest speakers. After months of practice at their home schools, the entire ensemble came together Sunday afternoon at the Pearl Studio in New York City for the first time. And, under the direction of a dynamite conductor, Julie Yu, they made magic. Monday night these amazing youngsters from across the country stood on the Perelman Stage in the Stern Auditorium and became a part of its history. And, once again, I was the mom in the back, crying her eyes out, holding a cell phone and trying to sneak pictures. Lora Leigh, age 5, before her stage singing debut. Age 17, before her performance with the Honor Choir at Carnegie Hall.